Dirty Rotten Scoundrels was a more critically and commercially successful version of the film it was "remaking"—the 1964 David Niven/Marlon Brando comedy Bedtime Story. 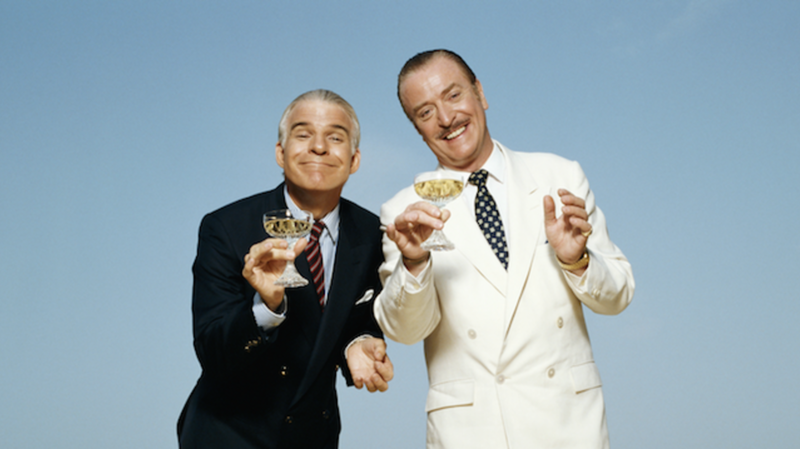 The 1988 version starred Michael Caine as classy con man Lawrence Jamieson, and Steve Martin as the more lowbrow, American upstart huckster Freddy Benson. The two make a bet that they can con Janet Colgate (Glenne Headly) out of her money, with the loser having to leave the French Riviera. Here are 12 facts you need to know about the popular con man comedy. 1. IT WAS ORIGINALLY MEANT FOR MICK JAGGER AND DAVID BOWIE. The two singers, fresh off their collaboration with their "Dancing in the Street" cover, wanted to do a movie together. Jagger, who found screenwriter Dale Launer's first produced screenplay Ruthless People (1986) to be brilliant, suggested that Launer write a script for them. The writer thought Bedtime Story, starring David Niven and Marlon Brando, would work for them. Launer, as instructed, thought up ways to allow Jagger's character to sing in the movie without turning it into a musical. Eventually, Launer was told Jagger and Bowie wanted a "more serious" project. In 1992, Bowie expressed displeasure at not getting to do Dirty Rotten Scoundrels. "How 'bout them apples! Mick and I were a bit tweezed that we lost out on a script that could have been reasonably good," he told Movieline. 2. AT ONE POINT, IT WAS GOING TO BE AN EDDIE MURPHY MOVIE. Murphy had seen Bedtime Story on his uncle's recommendation. His production company, Eddie Murphy Productions, asked Launer to re-write it if they could get the rights to the movie from Universal. It would later be revealed that everyone had mistakenly thought Universal owned the rights; it had reverted back two years earlier to co-writer and producer Stanley Shapiro. Launer and his lawyer bought the rights from him. Launer then tried to sell the film to Paramount Pictures, with Eddie Murphy attached. To Launer's surprise, they said no. Murphy then dropped out. 3. IT COULD HAVE BEEN A MONTY PYTHON REUNION. John Cleese claimed he was offered the role that would later go to Michael Caine, but he turned it down because filming would have taken place right after six weeks of publicity work for another movie. It was a decision he would later regret. Michael Palin read for Lawrence and was one of the finalists for the part. It wasn't just former Pythoners—Richard Dreyfuss and Matthew Broderick were also in the running to star. 4. STEVE MARTIN WANTED TO PLAY LAWRENCE. Director Frank Oz gave Steve Martin the script, and Launer was told that Martin "swooned" over it and was to play David Niven's role. Launer, however, saw him as Freddy, since Freddy was a "lout" just like Martin's stand-up persona. To Oz's surprise, Martin changed his mind. 5. IT WAS SHOT ENTIRELY IN FRANCE. Scoundrels was shot, as was explained in the end credits, entirely on location in the south of France and at La Victorine Cote D’Azur Studios in Nice. Caine stayed in a St. Paul villa during shooting and later recalled with a laugh, "It’s tough duty, but someone’s got to do it, you know?" 6. THE TEASER FEATURED A SCENE THAT ISN'T IN THE MOVIE. Frank Oz, believing he didn't have enough footage yet to make a good trailer, shot a scene not in the movie of Caine and Martin taking a little stroll. 7. THE CREW DIDN'T LAUGH. When Michael Caine was asked what the most important lesson he learned in making movies over the decades, he had Scoundrels in mind. "If you’re doing a comedy and the crew laughs, it’s not funny [laughs]. I did Dirty Rotten Scoundrels with Steve Martin. The crew never laughed once at anything. It’s the funniest film I ever made." 8. CAINE WONDERED WHY THEY WERE REMAKING A FLOP. When Caine asked Oz why they were remaking a commercial flop, Oz said there would be no point in remaking a film that had been a success. That was good enough for the actor. 9. CAINE HAS A FAVORITE SCENE. "It’s one of those films where you’re just waiting for your favorite bits to happen," he said. "For me, it’s when I’m hitting Steve’s knees playing Dr. Shauffhausen. (laughs) I’m laughing now thinking about it." 10. FREDDY GETTING UP FROM HIS WHEELCHAIR WASN'T FUNNY AT FIRST. In a test screening, the scene didn't get many laughs, to the surprise of Frank Oz and the editors, Stephen A. Rotter and William S. Scharf. Launer then had an idea. "I suggested laying in some inspirational music, something hugely dramatic like Thus Spake Zarathustra, or Handel’s Messiah (the "Hallelujah" chorus) and they tried it, played it and it got a good solid laugh." 11. OZ AND THE EDITORS MADE A POTENTIALLY BIG DECISION ABOUT LAWRENCE. Launer revealed that at the end of his script, it turned out that Lawrence Jamison knew all along that Janet was The Jackal. "And he’s fallen in love with her. You think he’s fallen in love with her because she’s so guileless, so honest, so decent – and then she takes him – and you feel bad for him. But, in the end, you find out he did fall in love with her, but not because of her guilelessness, but because she was such a good con artist. I think the director and editor saw that it could work either way, so they changed it. Maybe it’s better, but it’s an editing change. It’s not much different actually." 12. REBEL WILSON IS ATTACHED TO STAR IN A FEMALE REMAKE. Two female scam artists, one being Wilson, will compete to con a naive tech prodigy out of his fortune.